"Class of 1976 Gift -- Clock Tower/Bell Tower"
Photo displayed here is from the 1980s. 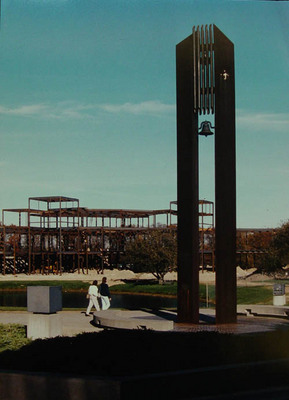 The Bell Tower/Clock Tower was located on the plaza between the Unistructure and the Koffler Center and Communications Complex. It was removed in 2005 during Koffler Center expansion and plaza renovations.